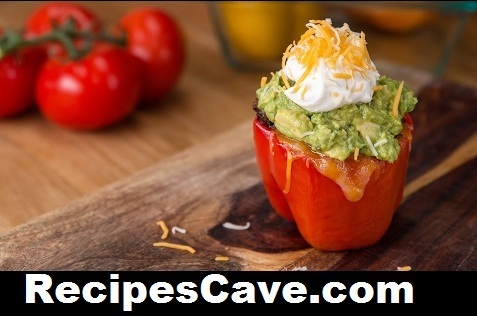 Taco Stuffed Peppers Recipe - Another vegetarian recipe with peppers, follow simple steps to cook Taco Stuffed Peppers. Wash and dry the peppers. Using a sharp knife, take off their tops and remove the seeds and pith. Arrange the peppers in an oven-safe dish so that they stand upright. While the peppers are baking, begin cooking the quinoa. Add olive oil to a medium-sized pot or dutch oven with a lid. Add onion and cook over medium heat until tender, about 3 minutes, or until starting to become tender. Add garlic and cook for an additional 2 minutes. Add spices and quinoa. Sauté the quinoa for 1-2 minutes before adding the the vegetable stock. Bring to a boil over high heat for 2 minutes. Reduce heat to a low simmer and cook covered for 20 minutes or until the quinoa is cooked and has absorbed all the remaining liquid. Your Taco Stuffed Peppers Recipe is ready to taste.